Pentax Spotmatic SP – John's Cameras. This is the archetypical SLR camera from 1960s Japan. Although it clearly builds on Zeiss Ikon’s precedent with the Contax S and also on Asahi’s earlier Pentax cameras (such as the SV), it is also very much its own camera. To look at, it is almost identical to the earlier Pentax SV but with the addition of a meter switch and a repositioning of the self-timer mechanism. This photo shows the Spotmatic next to a SV for comparison. The camera body measures 143 by 92 by 48 mm. It weighs 618 g with no lens attached and no film loaded. Most of the camera body is covered with black leatherette with the top plate, base plate and lens mount being satin plated metal. The top plate is almost identical to the SV’s. The film advance lever is on the right. This looks to be die-cast metal and is nicely shaped to fit the user’s thumb. In use, it rotates about 180º two advance the film one frame. The lever is on a ratchet so it is possible to advance the film with several small movements of the lever if necessary. It goes without saying that this lever automatically sets the shutter curtains. The film advance lever also incorporates the frame counter. This resets to -2 when the back is opened and counts up. Every fifth number is displayed. Zero, 20 and 36 are in red. The two common film lengths in the 1960s were 20 frames and 36 frames. The more modern 24 frame length is much more recent. To the left of the film advance lever and at the front of the top plate is the shutter release button. This is a chromed metal cylinder within a chromed metal sleeve. It is threaded for a standard cable release. Between the film advance lever and the shutter release button is a very small (1.5mm diameter) window onto a red flag. This flag shows when the camera is ready to take a shot. Once the shutter has been fired, it becomes black. I don’t find these small flags useful at all – I check by attempting to advance the film – but other users might vary. Next along is the speed selector dial. This has two functions. First is to set the film speed for the light meter. This is in ASA units only and ranges from 20ASA to 1600ASA. This is an entirely adequate range and covers most films on sale in the 1960s. This film speed is set by lifting the dial and turning until the required speed is displayed in the window. It is possible to set 1/3 stops if required. Second, this dial sets the shutter speed. This is set by turning the dial without lifting it until the required speed is against the index mark. Speeds are from one second to 1/1000 seconds plus B. Just to the left of the speed dial is a triangular index mark to indicate the selected shutter speed. Most of the time this is black but will turn red on occasion. This index pointer turning red indicates that the shutter speed selected is outside of the light meter’s operational range. This is dependent on the film speed set. For example, with the film speed set to 1600 ASA, the idea will turn red for 1/8 and 1/4 seconds. At 800 ASA, it is red at 1/4 and 1/2 seconds. At 20 ASDA, the index is red for 1/1000, 1/500 and 1/250. The camera will still work at these shutter speeds, you just cannot rely on the light meter. 1/60 has a red X beside it to indicate that this the fastest shutter speed at which the entire frame is exposed at one time, all faster speeds use a travelling slit. So this is the fastest shutter speed for using electronic flash. Flash bulbs can be used at all shutter speeds as the output of light takes place over a longer time. The pentaprism hump is just to the left of centre. On the rear is the viewfinder eyepiece. this measures 14 by 9 mm internally which is plenty large enough even for us spectacle wearers. The outside of the eyepiece has a grove on either side to take the optional accessory shoe. The front of the pentaprism hump bears the legend “AOCo” (Asahi Optical Company). Inside the viewfinder, in the centre, is a circle of micro prisms which help when focusing the lens – when out of focus, the micro prisms exaggerate the out-of-focus of the image. To the left of the pentaprism hump is the model name (SP) and the serial number. Left of this is the rewind crank. This crank doubles as the catch for the back. Around the rewind crank is a film type reminder. This has four options – empty (very useful!) colour daylight, colour tungsten and Panchro(matic). Looking at the front of the camera, the lens mount is the standard M42 threaded mount. This was introduced in 1949 by the East German Zeiss Ikon with the Contax S. Although this lens mount was used by very many camera makers, the popularity of the Pentax series resulted in this mount being known as the Pentax mount. This mount has a 42 mm diameter thread with a pitch of 1 mm. This mount has two flavours. The more basic form is just a thread to attach the lens to the camera. 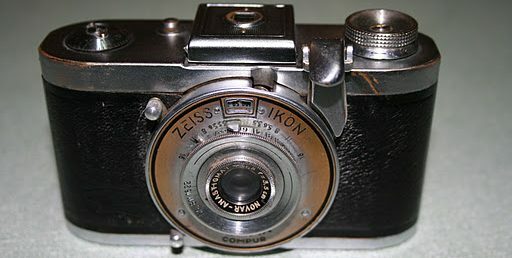 This form was used with the Soviet Zenit B and Zenit E cameras. The more advanced form of the mount has a plate just inside the bottom of the mount. This plate moves forwards where the shutter release is pressed and pushes a pin on the lens – this causes the lens’ iris diaphragm to close to the set value. The advantage of this version is that you can compose and focus with the diaphragm fully open, giving you a brighter image in the viewfinder. On the right-hand side of the lens mount (left side when using the camera) is a sliding switch marked ‘SW’. Pushing this up closes the lens’ diaphragm and switches on the internal light meter – there is a small red flag on the switch to indicate that the switch is raised (not very useful and not present on later Spotmatics). This system is shutter priority – you set the shutter speed you want and then adjust the aperture until the meter needle is centred. It is possible to set the aperture and adjust the shutter speed until the meter needle is centred but this is very awkward to do at eye-level. On the camera body below this light meter switch are two PC connectors for a flash gun. The top one is for fast flash bulbs and can be used any any shutter speed. The lower PC connector is for electronic flash and must be used at 1/60 seconds or slower. The difference between the two PC connectors is timing. The lower connector is switched on as soon as the first shutter curtain completes its travel – the whole film frame is now exposed. The top PC connector is switched on very slightly before the first shutter curtain moves allowing a few milliseconds for the flash bulb to burn to maximum brightness before the frame is exposed. The other side of the lens mount has a self-timer. This has moved from the ring around the rewind crank on the SV to this position on the front of the camera. To use this, you turn the self-timer lever anti-clockwise through up to 180º. It is activated by pressing the small stud above the lever. On my 55 year-old camera, this gives a twelve second delay before the shutter fires. If you turn the lever through less than 180º, you get a proportionally shorter delay. when the standard changed from Whitworth to UNC). Beside this is the battery compartment. The camera was designed to take a mercury battery giving 1.3 volts but these are no longer available. Modern alkaline or silver batteries can be used as the light meter uses a bridge circuit so the exact voltage is not critical. The battery powers only the light meter – the rest of the camera is entirely manual. At the other end of the base plate is the button to disengage the film advance mechanism to allow the film to be rewound. On the back of the base plater on the right is what looks to be a second serial number – 23102. The only other feature on then outside worth noting is the presence of a strap lug on either front corner. The back is opened by pulling up the rewind crank. There is not a lot to notice here – it is all rather normal. The film cassette goes on the left – the rewind crank pulls up even further to allow the cassette to be inserted and removed. On mat camera, there is a sticker in the cassette chamber – this is dated 2-28-79 which I take to be the date of a repair. The film gate is in the middle with generous amounts o9f metal on either side to help keep the film flat. The shutter curtains are very rubberised – there is no visible trace of the underlying fabric. The sprocket shaft is black plastic and the take-up spool is black painted metal. The take-up spool rotates ‘backwards’ so as to hold the film emulsion side outermost. Around the rear of the camera is a groove. Flanges on the hinged back fit into these to keep, out light. With Japanese cameras, it was usual to have a strip of foam in this groove to ensure complete light tightness. This foam ages and will eventually deteriorate to a sticky goo. The foam on this camera has clearly aged but has not turned to goo. so I am going to leave it be while I shoot my test film. Embedded in the groove above the take-up spool is a reset button for the frame counter. The flange on the hinged back has an additional lug which presses on this reset button while the back is closed.This allows the frame counter to work. When the back is opened, this lug no longer presses on the button and the frame counter will reset to -2. When loading a new film, you wind on the film until the frame counter reads 0. The middle of the back has the sprung pressure plate that keeps the film flat against the film gate. At the catch end of the back is a leaf spring which stops the film cassette moving about.